Yes, it’s preseason, and yes it was just plain fun to see live Minnesota United soccer again. But for anyone hoping for inspiration and excitement, Saturday’s match against the USL’s Charleston Battery on the first match day of the Carolina Challenge Cup offered neither. The Loons slumped to a 0-1 loss to the tournament hosts in a foggy, sloppy match on a foggy, sloppy evening in the Holy City. Three weeks ago, I pledged to give this year’s iteration of the Loons a fresh start. But the club appears unwilling to let me do that. The starting eleven was nearly identical to the starters from the club’s previous three preseason games, which was in turn nearly identical to the starters of the final regular season match of the previous season. The team seemed not much closer to satisfactorily answering the three tactical questions I wrote about last week. Following a season in which the team’s coaching staff repeatedly made allusions to the players at their disposal simply not being up to scratch, it is disquieting to see the team start another year with the exact same players in the exact same positions, and having not resolved the exact same problems. That first group began with Bobby Shuttleworth back in goal, with newcomer Tyrone Mears at right back, Michael Boxall and Francisco Calvo as center backs, and Jérôme Thiesson shifted over to the left back position. The midfield featured the familiar pairing of Sam Cronin and Ibson. Ethan Finlay occupied the right wing and Sam Nicholson was his opposite number on the left. Abu Danladi was selected as the starting striker. The crucial variable was the eleventh player, Kevin Molino, (nobody is more sorry than I to still be writing about this) who was expected to start the game as a central attacking midfielder to complete the 4-2-3-1 formation. But in reality, Molino operated as a second forward, playing on the same line as Danladi. This tactical nuance seemed to not have been communicated to the rest of the team, and it caused an enormous amount of trouble. The central theme of the game’s opening half was the massive gap that repeatedly emerged for Minnesota in zone fourteen, the most essential attacking area of the field. The Loons possessed the ball for much of the first half, having no trouble getting it to Ibson in positions to drive forward. But the Brazilian almost never could find options to progress the ball in the central areas, usually because they didn’t exist. He was repeatedly forced to cycle it backward or to the wing, or (worst of all) attempt to do too much and turn it over, springing the Battery on the counter. The first-half eleven played a 4-4-2, which was really a 4-4-1-2 if you count the void as a player. In forty-five minutes of work, the game’s starting group could not muster a single shot on goal, and only on a few occasions did they cause any kind of discomfort for the Battery. Those occasions mainly came through good individual work, with Ethan Finlay and Sam Nicholson each creating an opportunity through one-on-one wins. When players did get free or find the ball in pockets of space, the rest of the team was extremely slow to notice the opportunity. The most telling moment of the half came about twenty-five minutes in. 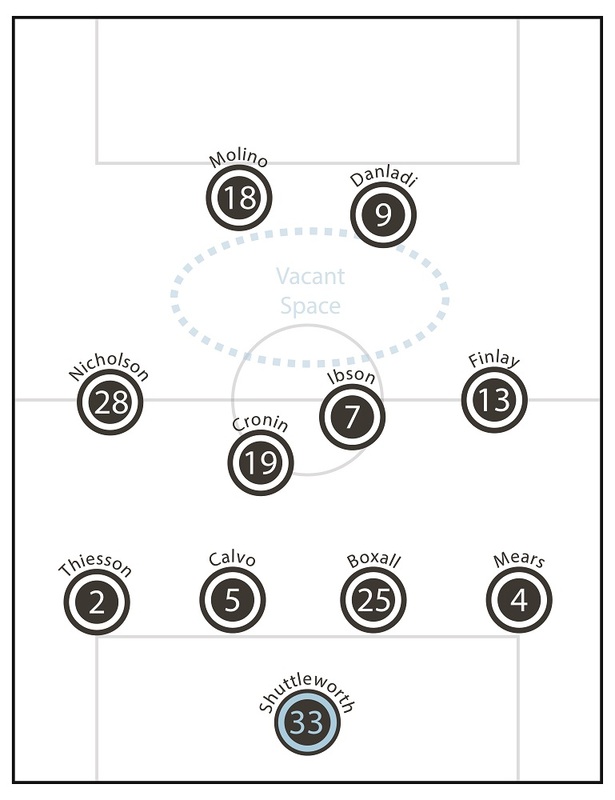 Finlay was slipped the ball in a huge gap between Charleston’s midfield and defensive lines, and in the half space between the left back and left center back. But when he turned to play a pass, neither Molino nor Danladi—who were standing at the top of the box in more or less the exact same area—moved more than a step. The half ended with a whimper, when the Loons defense went to sleep, yet again, within five minutes of halftime. That allowed Large Adult Son and former Rayo OKC striker Ian Svantesson to pounce on a loose ball, kick it off Boxall, and have it deflect into the net. It was a dumb goal, the kind of goal the Loons gave up constantly last year. It’s a matter of focus. Overall, on the pretty Minnesota-favored balance of play, it wasn’t deserved, but in that moment, it certainly was. 5. Yes, I’m going to try out a version of Matt Doyle’s weekly MLS recap format this season. The first part looks at a single issue in more depth, and the rest of the article is a numbered list of quick hits like so. 4. The best player in the first half for Minnesota was right back Tyrone Mears. He had one awful defensive moment, but otherwise he combined well with his teammates, pushed forward in support of Finlay and the midfielders in the center, and just generally knew what he was doing. I had a lot of doubts about his signing, and I still have questions about his age, his durability, and his defense. But I will grudgingly admit that I can see what the club was going for. If Mears can give the Loons twenty to thirty solid outings and be a good teacher for Carter Manley, then he will be a good purchase for Minnesota. 3. 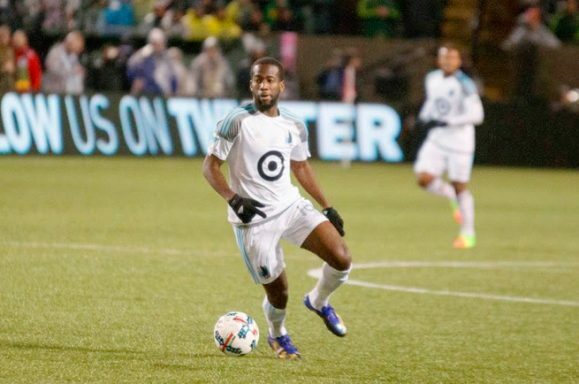 Three of Minnesota’s rookie draft picks all impressed in the team’s second half XI. #23 pick Manley was solid as the right back, keeping the game in front of him and picking good moments to move forward. His one error came in misjudging a bouncing ball, which led to Collen Warner’s red card. #15 pick Wyatt Omsberg caught the eye as the team’s left sided center back. He is tall, gangly, and often looks rushed even when he isn’t. But he worked well with his partner Brent Kallman, had a number of good clearing headers, and made a brief cameo as an offensive threat following a corner kick. His left foot is an advantage, and he was tidy on the ball. #7 pick Mason Toye at times struggled to find the game, but he had two electrifying moments when he got on the ball and badly fooled a Charleston defender with a lightning quick cut-back. The first time he did it, however, he was forced to bring the ball back onto his right foot in order to cross it, only winning a corner. If he was more confident at playing the ball with both feet, that move would be quite a bit more dangerous. 2. The other closely watched newcomer for Minnesota was winger Frantz Pangop. The Cameroonian was certainly fast and aggressive as advertised, but his touch looked rusty, and he gave the ball away on several occasions with stray passes or dribbles. But as the half wore on, he seemed to become more comfortable. He and Toye combined for the Loons’ best moment of the night. Following a turnover in the Minnesota third, Pangop carried the ball in space across midfield, where he fed Toye into space, then darted for the back post. That probably wasn’t the right choice, since Christian Ramirez was also headed there, but Toye’s cross went over Ramirez, and Pangop found himself well positioned. He volleyed the ball well back across goal, but Charleston goalkeeper Odisnel Cooper aced his only test of the night with a diving save. It’s hard to know what exactly to make of Pangop, but in the coming days with more matches against MLS opposition, we should get a better idea of what the winger offers. For now, fans have justification to feel some cautious optimism. 1. The final Loon who stood out was Miguel Ibarra. It’s not always easy to quantify his impact, especially as his production or end product sometimes disappoints. But Ibarra’s energy gave the second half an invigorating jolt. Seemingly freed of any strict tactical instruction, he often seemed to play all three attacking midfield positions at once, passing and following the ball across the field, buzzing around like a bee bringing pollen across a bed of flowers. Ibarra’s link-up play and ability to play a supporting role anywhere on the field can provide the tempo and direction for the game if you let it, as a sort of short passing version of Ibson (sometimes I wonder what would happen if you played Batman as a #8). Additional credit goes to Pangop as well, for adapting seamlessly to Ibarra’s movements. While both the first and second half teams played a 4-4-2, the second half group never had the problem of the vacant zone fourteen, because, when the ball moved to one side of the field, the opposing winger would come over to play in that central attacking pocket, with their full back moving into the wing role. It was a little tactical understanding that made a massive difference in opening up space in the final third and allowing the Loons to quickly press if they lost the ball. It’s only preseason and there’s another game on Wednesday. There is plenty of time for Minnesota to figure it out. Turn up the #PANIC knob a hair, but not much more than that.